(AFP) - UN envoy Martin Griffiths prepared Tuesday to head to war-torn Yemen to lay the groundwork for peace talks in Sweden, after fresh fighting shook the flashpoint city of Hodeida. Both sides have in the past week expressed support for the envoy and his mission to hold talks in Stockholm, but fierce clashes flared up in the Red Sea city of Hodeida late Tuesday. This followed battles Monday that military officials said were the worst since loyalists halted an offensive last week, concentrated in the eastern part of the city where rebels fired artillery. Pro-government forces struck back, supported by warplanes from the Saudi-led coalition, which launched a dozen raids, the sources said. According to Huthi-run media, Monday's clashes lasted up to four hours and resulted in fatalities. After a quiet day Tuesday, fierce fighting erupted again around midnight in the city's southern and eastern parts, according to an AFP correspondent and residents. 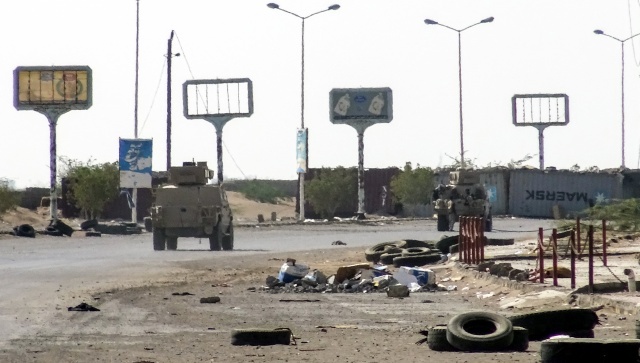 Just hours before Griffiths' planned visit, residents in the east of Hodeida told AFP by telephone they could hear fighting, and reported shrapnel falling in residential neighborhoods. On Monday, Britain presented to the UN Security Council a draft resolution urging an immediate truce in Hodeida, whose port serves as an entry point to nearly all imports and humanitarian aid to the impoverished country. The draft, circulated by Britain to the 14 other council members, and seen by AFP, sets a two-week deadline for the warring sides to remove all barriers to humanitarian aid. The proposed resolution would significantly ratchet up pressure on the Saudi-led coalition and the Huthis to seek a negotiated settlement in Yemen, where millions are on the brink of starvation. It also calls for a large injection of foreign cash to support Yemen's collapsing currency and for salaries of civil servants, teachers, and health workers to be paid within a month. Mohammed Ali al-Huthi, head of the Huthi rebels' Higher Revolutionary Committee and an influential political figure, tweeted Monday he wanted his group to announce "readiness to suspend and halt all military operations" and stop firing missiles on Saudi Arabia. Riyadh also lent its support to fresh talks. Saudi King Salman told the Shura Council, his country's top advisory body, that the kingdom backed a "political solution" and a "comprehensive national dialogue" in Yemen. Multiple past attempts to hold negotiations between the government alliance and Huthis have failed. Griffiths said Monday he hoped the rivals would meet in Sweden "within the next few weeks". No date has been set. Human Rights Watch on Tuesday called on France to address laws-of-war violations with the UAE -- a key member of the Saudi-led coalition -- during Crown Prince Mohammed bin Zayed al-Nahyan's visit to Paris on November 21. "If President (Emmanuel) Macron is truly concerned about the humanitarian crisis in Yemen, he should tell the crown prince that France will stop selling weapons to the UAE if there's a real risk of their unlawful use," said Benedicte Jeannerod, HRW's director for France. The World Health Organization says nearly 10,000 people -- mostly civilians -- have been killed in Yemen since the Saudi intervention in March 2015, but rights groups believe the toll may be five times higher. The World Food Programme says up to 14 million Yemenis are at risk of starvation. On Monday, Saudi Arabia and the United Arab Emirates announced they would each give $250 million in aid to the war-ravaged country to support more than 10 million people.